It contains so many actual natural ingredients (I don’t need 15 different types of plants in my laundry soap, thank you very much) that it actually makes my skin break out/itch more than a bath in red dye #40 would! I told my mom that I would give her new discovery a try, after all my Arm & Hammer Free and Clear bottle was nearly empty. Also, the statistic that 95% of laundry detergent contains formaldehyde kind of freaked me out. My initial reaction? Cute packaging, but lets see the ingredients list. I flipped the bag over and was shocked to read the following: sodium carbonate from the Green River Basin in Wyoming, sodium bicarbonate, epsom salt, sea salt, and a minimal amount of organic peppermint essential oil. For once, the ingredients were truly all natural. The real test would be how this detergent would wash my clothes and whether or not it would flare up my eczema. Let me tell you, this laundry soap has passed “the restaurant test” and “the eczema test” with flying colors! When I get home from a waitressing shift I smell like an overwhelming combination of hickory wood and crab cakes The restaurant I work at is constantly running an open-flame grill which leaves my hair, body, and clothes completely saturated with smoke at the end of the night. After one wash using a very minimal amount of Molly’s Suds, my restaurant clothes did not smell at all. In fact, they smelt fresh and felt soft, with no fabric softener added. I was suddenly a believer. After wearing my clothes that had been washed in Molly’s Suds for a few days, I realized how non-scratchy they felt and how much more soothing they were on my skin than my ones washed in Arm & Hammer. I immediately dumped my entire closet into the washing machine to rinse everything I owned in Molly’s Suds. The best part about Molly’s Suds? It lasts an insanely long time! I wash my clothes so much that I was buying a family sized jug of Arm & Hammer every 2 weeks! So far I have been using this same bag of Molly’s Suds for over a month. I am excited to have been introduced to a product that is good for my skin, my clothes, and the environment. It has been a struggle since I was a baby to find a detergent that would really clean my clothes and not cause breakouts. 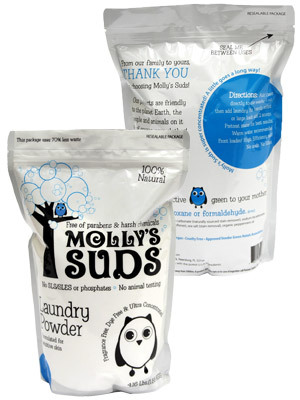 Molly’s Suds also sells a detergent specifically for athletic clothes and a non-toxic, flea-killing dog wash! Check out the Molly’s Suds website to read more about the different products offered! Thanks! You should check it out, it is really great stuff. That sounds so cool! I am sad that it doesn’t look like it’s available in Canada though. One day, hopefully! Shoot my mom an email, I’m sure she’d be happy to mail you some!! Not sure if the shipping costs would be worth it for you, but she can quote you. That’s cool that you found something that’s actually ‘all natural’ and effective. Thanks for sharing! ohhh this looks good! Definitely trying some when I run out at home. Awesome! I think you’ll love it and get hooked like I am! Got a bag from your mom and now I am really looking forward to trying it. Awesome!! I hope you like it! I’m so excited you are on the Molly train! I’m STILL using the same bag and I’ve had it for probably 3-4 months (family of 3)!!! I’m going to also buy the liquid Molly Suds for sports because my husband works out a lot and his clothes are starting to get that musky smell even after washing. Molly says that that smell is actually bacteria from the sweat (ewwww), but that she has a product proven to work! I’ll let you know how it turns out! Awesome! Once I start hitting the gym again ill be able to really test out the athletic wash haha…. And one bag for 4 months, that’s amazing. Soo much cheaper than buying the regular detergent bottles. It leaves no residue whatsoever, it is amazing! I was totally skeptical, but I couldn’t be happier with it! I was really surprised at how clean my clothes felt and smelt, too. I’ve never had any residue left on my clothes from it either, and I like that the there is no overwhelming smell to it (especially since I’m pregnant). Do you know if you can use it with um… those … high-efficiency washing machines? Never mind! I answered my own question looking at the website! Yes you can, no problem! I actually have one and it works great. You are supposed to dump the detergent right in the washer, not in the laundry cup that some washers have. I think there is more info about it in the website. Yeah, I saw that. Hm… my boyfriend is a weirdo and totally OCD about the washing machine LOL. I wonder if he’d allow for this! It doesn’t leave any residue on your clothes? This sounds amazing. I JUST NOW emailed your mother about this detergent. Hopefully it’s not too late for the 10% discount haha! Awesome!! Did she get back to you? I hope she can still do it! I need to order more soon, still loving the stuff. Glad to hear you still love it! LOL. I’m nervous about it because it’s expensive (for detergent anyway), but I think it’ll be worth it. Does it leave any gross residue on your clothes or anything? Arm & Hammer Fragrance Free (or maybe another brand IDK), used to leave a white film on my clothes. And yep, she did get back to me and can still do it! I do have a HE washer, you put the powder directly in the washer not in the canister! There are some tips and there are probably some FAQ’s on the site too!! I really hope you like it!